In this photo from a 1926 biography of Hertha Ayrton, captioned "Mrs. Ayrton in her laboratory," the British scientist and inventor stands in the "lab" in her own home where she conducted all her experiments. Ayrton was the first woman to be proposed for fellowship of the British Royal Society, but her candidacy was denied on the grounds that as a married woman she had no legal existence in British law. 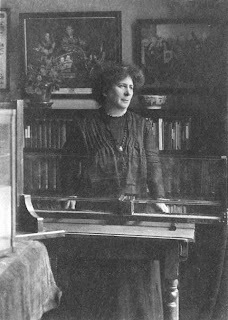 Hertha Ayrton, born Phoebe Sarah Marks, was a distinguished British woman scientist, who, in 1902, was the first woman to be proposed for the fellowship of the Royal Society. Hertha’s candidature was refused on the grounds of her ineligibility for the fellowship. As a married woman she had no legal existence in British law! In 1906 she was awarded the Hughes Medal of the Royal Society for original discovery in the physical sciences, the first woman to receive it for work exclusively her own. Her father, Levi Marks was an immigrant from tsarist Poland. He was a watchmaker by trade, but struggled to make a living as a hawker trading on foot. He met Alice Theresa Moss, the daughter of Joseph Moss, a glass merchant of Portsea, Hampshire, and married her in 1851. After Levi Marks’s death in 1861, his widow Alice, who was then pregnant with their eighth child, supported the entire family by her needlework, until they were old enough to go out to work. Hertha was educated from the age of nine by her maternal aunt Marion Hartog, who together with her husband owned a school in London, where they educated their own children. She studied French and music, the stock-in-trade subjects of a governess, but she also learned mathematics and Latin from her talented male cousins. At sixteen Sarah began work as a live-in governess in London, sending money home to her family in Portsea. She was befriended by the family of Karl Blind, Jewish-German émigrés. Karl’s daughter, Ottilie, (married name, Hancock) nicknamed Sarah “Hertha” after the ambitious heroine of a novel by the feminist Swedish writer, Frederika Bremer. Ottilie encouraged Hertha to study for the Cambridge University Local Examinations for secondary schools, which had been opened to girls in 1865 after a campaign by Emily Davies and Barbara Bodichon. Hertha passed the examination in 1874, taking honors in English and mathematics. Ottilie took Hertha to suffrage meetings where she met the most significant mentor in her career, Barbara Leigh Smith Bodichon (1827–1891), the leader of the Langham Place feminist activists. In 1869 Bodichon and Davies had co-founded the first university college for women, Girton College, Cambridge. After interviewing Hertha, Bodichon organized and paid for advanced mathematics lessons and arranged a loan so that she could attend Girton. Hertha read mathematics at Girton and in 1881 was informally placed in the third class. Women were not awarded degrees by Cambridge University until 1948. She came to science through invention. As a student she constructed a sphygmograph for recording the pulse in arteries. Her first significant invention was a line-divider, consisting of a series of parallelograms, designed for the purpose of dividing a line into any number of equal parts; while its primary use was likely to be for artists for enlarging and diminishing, it was also useful to architects and engineers. Barbara Bodichon and Lady Goldsmid (another doyenne of the 1866 suffrage movement and a major benefactor of Girton) together advanced her enough money to take out patents. This invention was shown at the Exhibition of Women’s Industries and received much press attention. In 1884 Hertha started to attend evening classes in electricity at Finsbury Technical College given by Professor William Edward Ayrton, a pioneer in electrical engineering and physics education and a fellow of the Royal Society. Hertha married Will Ayrton, a widower, on May 6, 1885, taking on the role of step-mother to his four-year-old daughter, Edith. Edith (who married Israel Zangwill) wrote a novel, The Call (1924), which was a fictionalized version of the suffragette campaigns, with a woman scientist as heroine. Hertha’s own daughter was born in 1886, named “Barbara Bodichon” in honour of Hertha’s mentor. She became organizer for the Women’s Social and Political Union, and in 1912 was imprisoned in Holloway for smashing windows. In 1914 Hertha gave £ 100 left to her by Bodichon to help form the United Suffragists, including both men and women. Hertha was a vice-president and her daughter Barbara the honorary secretary. In 1945 Barbara (married name Gould) entered Parliament as a Labour MP. Hertha’s mother, Alice, who had moved to London in 1890, died in 1898. In 1893 Will Ayrton’s research papers on the electric arc were used by a servant to light the fire. While helping him to replicate his experiments Hertha made a significant discovery. Electric arcs were used to produce bright light, the carbon electrodes and the gas between them being heated white-hot by the high-voltage discharge; Hertha developed the theory connecting the length of arc with pressure and voltage, and traced the hissing noise to oxidation rather than evaporation of the electrode material. This work was published in The Electrician in 1895. The Institution of Electrical Engineers invited her to read a paper in 1899, the first ever read by a woman. She was the first woman elected to membership, and to receive one of their prizes. At the International Congress of Women, held in London in 1899, Hertha presided over the physical science section. She spoke at the International Electrical Congress in Paris in 1900. Her success there led the British Association for the Advancement of Science to allow women to serve on general and sectional committees. She published The Electric Arc in 1902. Hertha was a close friend of Marie Curie. When Marie’s discovery of radium was attributed to her husband Hertha conducted a vigorous campaign in the press, commenting that “errors are notoriously hard to kill, but an error that ascribes to a man what was actually the work of a woman has more lives than a cat.” From 1883 until her death in 1923 Hertha registered 26 patents: five on mathematical dividers, 13 on arc lamps and electrodes, the rest on the propulsion of air. Patents make a clear legal claim to intellectual property, especially important for a woman married to a more famous scientist. Hertha was working independently on the formation of sand ripples by oscillations of water when her husband died in 1908. The application of this work came shortly afterwards. During World War I gas was a new and deadly weapon first used in 1915 at Ypres. Chlorine, phosgene and mustard gas were all used; mustard gas was the worst as it caused hideous blisters on the skin and slowly ate away at the victim’s lungs. Hertha applied the knowledge she had discovered about currents and vortices in water to the movements of air and designed a fan or flapper to push the gases out of the trenches. Her anti-gas fan consisted of a sheet of waterproof canvas supported by braces of cane down the middle. It had two transverse hinges and a hickory handle. The War Office dismissed her invention and acrimonious exchanges followed in the press, until the War Office finally issued 104,000 “Ayrton Fans” to soldiers on the western front. Hertha spent the rest of her career involved in research related to clearing noxious miasma from mines and sewers. She remained strongly committed to campaigns for female suffrage, and became involved with the newly-founded International Federation of University Women. She died of septicemia on August 26, 1923. Appleyard, Rollo. The History of the Institution of Electrical Engineers. London: 1939; Ayrton, Hertha. The Electric Arc. London: 1902; Crawford, Elizabeth. The Women’s Suffrage Movement: A Reference Guide 1866-1928. London: 1999; Girton College Register, 1869-1946; Hirsch, Pam. Barbara Leigh Smith Bodichon: feminist, artist and rebel. London:1998; Mason, Joan. “Hertha Ayrton and the Admission of Women to the Royal Society of London,” Notes and Records of the Royal Society. London: 1991; Sharp, Evelyn. Hertha Ayrton: A Memoir. London: 1926.